In recent decades, South Africa has experienced a growing economy and an expanding population, and as a result the supply of electricity within the country has become insufficient, resulting in narrowing reserve margins and frequent load shedding. State electricity producer Eskom, who supply 90% of electrical power to the southern African electricity market, has started a number of initiatives to resolve this problem, and one of the most important steps has been to construct the Medupi and Kusile coal-fired power stations. Both stations are larger than any station constructed in Eskom’s 92-year history. Medupi is a 6 x 800 MW station located near Lephalale in Limpopo Province, close to the border between South Africa and Botswana. Kusile is a largely similar, 6 x 800 MW station located in the industrialised Witbank area, in Mpumalanga Province, to the east of Johannesburg. 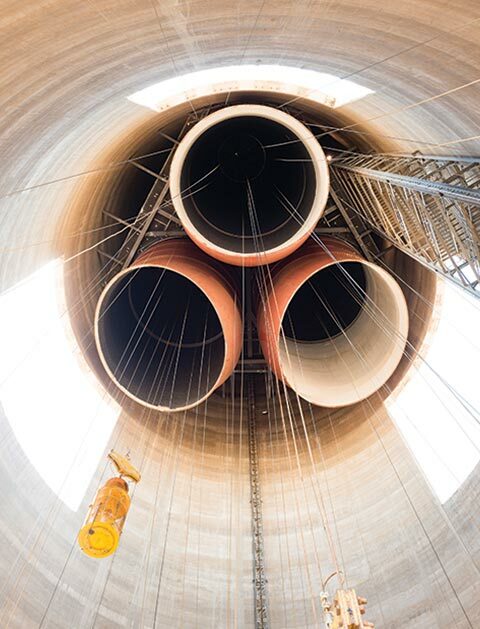 The Medupi and Kusile power stations use supercritical boilers, firing abundant, locally mined coal. To minimise the use of water, a scarce commodity in South Africa, both stations use air-cooled condensers, which are the largest of their type in the world. 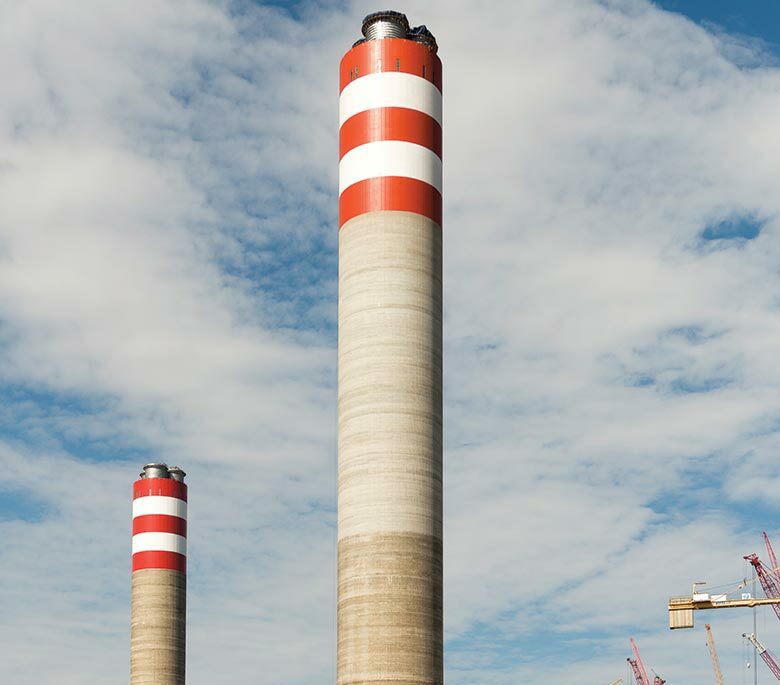 The Medupi Power Station is being constructed, and will be commissioned, without flue gas desulphurisation (FGD) plants initially, but designs are being prepared to retrofit FGD plants during the first major overhauls of the six units, after 6-8 years of operation. The Kusile Power Station is constructed with FGD plants, which will operate from the initial commissioning of the units. The station will use wet limestone gypsum FGD technology and to keep generating cost down, the FGD units will not use reheat. 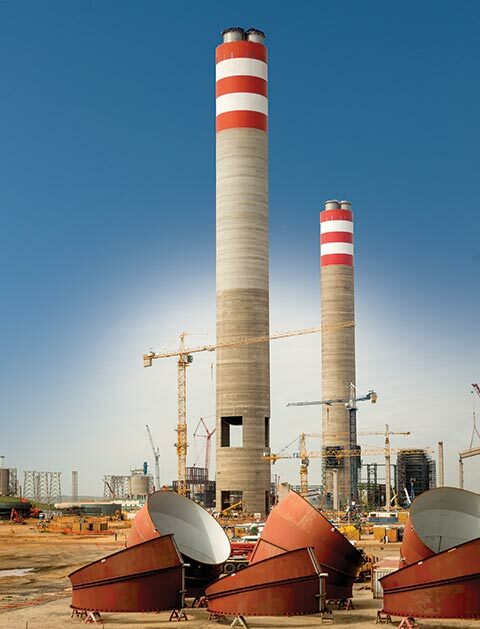 Both the Medupi and Kusile power stations use two, 220-metre high reinforced concrete chimneys, each with three steel flues. 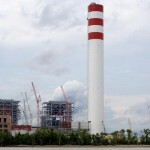 All four chimneys have been constructed by a consortium of Karrena Africa, Concor and Beroa Deutschland. All 12 steel flues have an internal diameter of 8.9 metres and they have been internally protected with PennguardTM linings, using 51mm-thick PennguardTM Block 55. Is it safe? A study into the work conditions on the platform during a large scale PennguardTM installation. 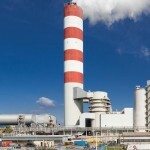 It is well accepted among owners and construction companies that health and safety are a prime concern for all parties on a chimney construction project. Because of this, it is also necessary to understand the effects of installing large quantities of PennguardTM lining materials in chimneys and chimney flues. In 2014, Hadek commissioned the AMD (“occupational medical services”) division of TÜV Rheinland to perform measurements on the Kusile project, at a time when PennguardTM lining installations were ongoing in three flues. In November 2014, two experts from TÜV Rheinland visited the Kusile site to perform a safety audit over a period of several days. As part of the safety audit, the experts carried out separate measurements for hydrocarbons, carbon monoxide, isocyanates and fine dust. PennguardTM Adhesive Membrane uses a specific asphalt based technology and when installers use large quantities of this material for the back and side joints of the PennguardTM lining system, this can be clearly smelled on the platform. 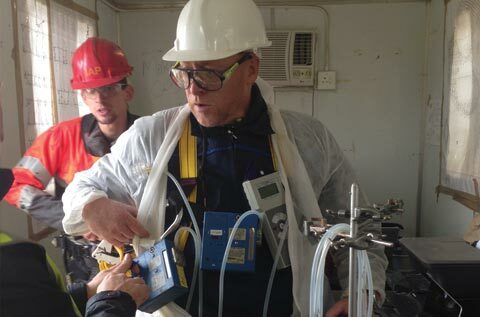 TÜV Rheinland’s measurements monitored for a range of hydrocarbons that are emitted into the air during a PennguardTM lining installation, including toluol, o-xylol, cyclohexanol, trimethyl benzol, and others. It was found that, for each substance, the concentrations on the work platform were well below the current workplace limit values in both Germany and South Africa. The current workplace limit value for carbon monoxide is 35 mg/m³, or 30 ppm. The maximum value measured on the platform (4.8 ppm) was well below this level. PennguardTM Adhesive Membrane uses a specific, urethane-based polymerisation technology and isocyanates are a category of potentially harmful chemicals that are used as part of that technology. 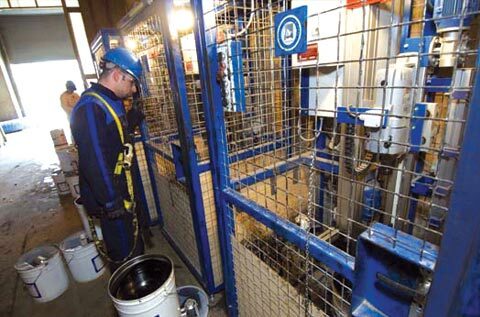 TÜV Rheinland used special measuring equipment and a proprietary analysis method to monitor for various, regulated forms of isocyanates on the work platform. It was found that for each these types of isocyanate, the measured value was well below the current workplace limit. When personnel handle cartons of PennguardTM Block, fine glass dust can be spread over the workplace, especially when unpacking cartons to stack PennguardTM Blocks for the installers around the platform. As part of their investigations, TÜV Rheinland monitored fine dust concentrations on all three active work platforms. On two of the three work platforms, the measured dust concentrations remained well below the German workplace limit value of 3.0 mg/m³, and even below the revised workplace limit value of 1.25 mg/m³ that must be achieved by end of 2018. On the third platform however, total dust and fine dust concentrations were measured to be well above the current workplace limit value. TÜV Rheinland’s measurements indicate that, although fine dust concentrations surrounding a large scale PennguardTM lining installation can be very low, elevated fine dust concentrations can sometimes occur. TÜV Rheinland recommend, that all personnel should use “FFP-2” particulate filtering masks. These masks are relatively inexpensive, as well as readily available. On nearly all large PennguardTM lining projects, the PennguardTM Adhesive Membrane is now mixed using Hadek’s automated mixing machines. TÜV Rheinland payed special attention to the safety in the Mixing Area, where several of these machines were working nearly all of the time. The work environment in the Mixing Area was found to be safe, with all measurements for hydrocarbons, carbon monoxide, isocyanates and fine dust well within the current workplace limit values. The Mixing Zone is a noisy place though, with a measured sound pressure up to 96 dB. Earplugs must be used here. 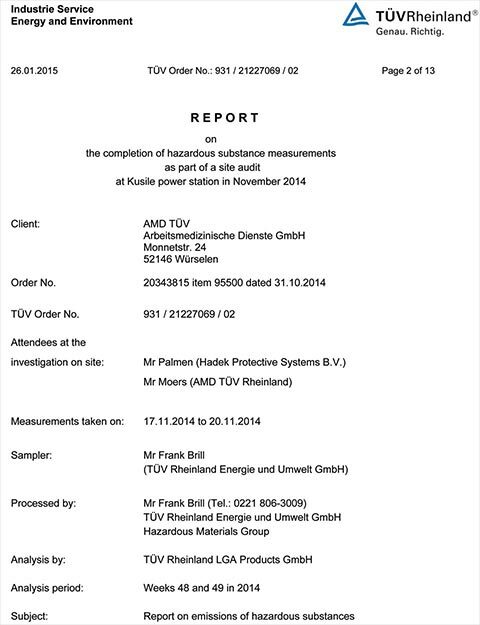 TÜV Rheinland did not perform a safety audit of the grit blasting and primer application works. This report describes the situation found at the Eskom Kusile project. Each customer must consider the circumstances of his own project to achieve a safe work environment. Interested customers may request to receive a copy of TÜV Rheinland’s full report. Before installing the PennguardTM lining system onto a steel chimney or a steel chimney flue, the surface is grit blasted to a “near white” (SA 2 1/2) cleanliness, made dust-free and coated with a primer. 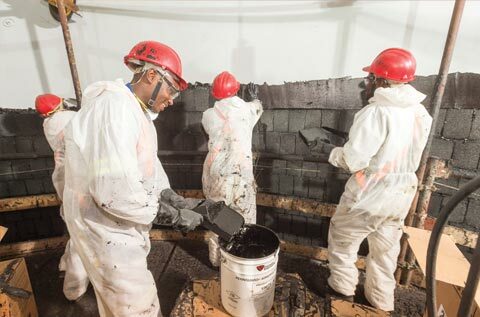 PennguardTM Block Primer has traditionally been used for this, and it offered compatibility with the PennguardTM lining itself as well as excellent application properties even for crews with limited experience in spray application methods. 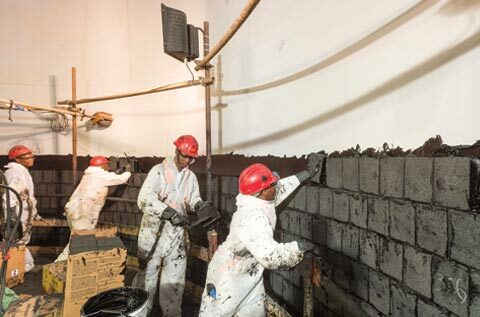 In recent years, it has become customary for chimney builders to perform grit blasting and primer application in a location well removed from the chimney itself, avoiding any grit blasting and spray painting activities on their core construction site. For projects of the size of Medupi and Kusile, this means that large numbers of steel flue sections are lined up at a remote location, waiting to be moved to the chimney at some time. While it is always recommended to keep grit blasted and primer coated steel flue sections dry and away from direct sunlight, this is sometimes hard to achieve and by the time the steel flue sections reach the chimney, localised corrosion may have occurred that results in expensive and time-consuming repairs. The PennguardTM lining is system is now offered with the option of a new, thicker, more durable primer, the PennguardTM HP Epoxy Primer. Unlike the dark orange PennguardTM Block Primer, the new product is white. PennguardTM HP Epoxy Primer is typically applied at a dry film thickness of 37-62 µm. At this thickness, the material cost is virtually the same as that of PennguardTM Block Primer. The application of the new primer is however more labor intensive and it requires more skill from the applicator. 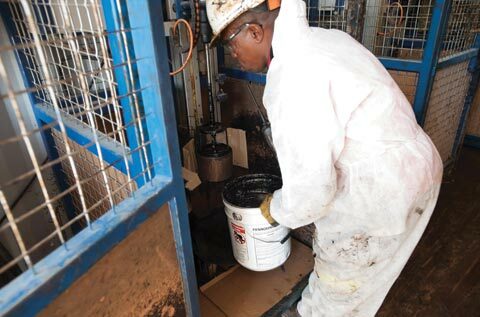 PennguardTM HP Epoxy Primer was first used on a large scale at the Kusile project and it was found to work very well.